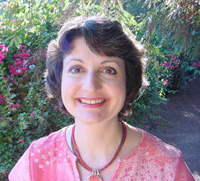 Christine Loter is a certified advanced clinical Hypnotherapist, healer, teacher and Reimaging™ Consultant. She has an extensive background in metaphysics, multidimensional healing modalities and paranormal research. She’s authored over fifty articles, had numerous media and Expo appearances and is host/producer of Secrets of Self Improvement, a Santa Barbara, CA community access TV show on channel 17. HopeDance Magazine - radical solutions inspiring hope in San Luis Obispo, Santa Barbara and Ventura Counties.